Are you looking to purchase a new or used piano and wondering how to describe the piano sound you want to find? Or perhaps you are selling a used piano and unsure the best words to describe the sound of your piano? This guide can help! What words describe the sound of a piano? The following words are commonly used to describe the voice of a piano. The voice refers to the tone or timbre of a piano (but doesn’t refer to the pitch). Bright is used to describe a high concentration of higher harmonics. When this tone contains a lot of tonal colors (a blend of harmonics), it is usually a very beautiful sound. A “bright piano tone” can be used to describe a pleasant, clear, clean, and brilliant sound. “Bright” can also be used in a negative connotation when the sound is tinny, metallic, or brassy. This is usually the result of a narrower or discordant spectrum of harmonics. A mellow tone has fewer upper harmonics, with stronger fundamental or “true” tones. A beautiful mellow sound is one that still has a spectrum of tonal color (harmonics), and that articulate the note in a rich and resonating way. Terms to positively describe a mellow piano tone include sweet, round, dark, and rich. If a mellow piano doesn’t have a range of harmonics, it will likely sound flat. This sound is more likely to be described as dead, dull, or weak. Often, if a piano has negative mellow sound symptoms, it may need new hammers, replaced bass strings, or may have a damaged soundboard. The term “color” in reference to piano tone is used to describe the variety of harmonics within a sound. When the timbre (blend of harmonics) of a piano’s sound is the same from note to note, it’s considered an even tone. When the harmonics are different from note to note or in a few notes, the tone is considered uneven. 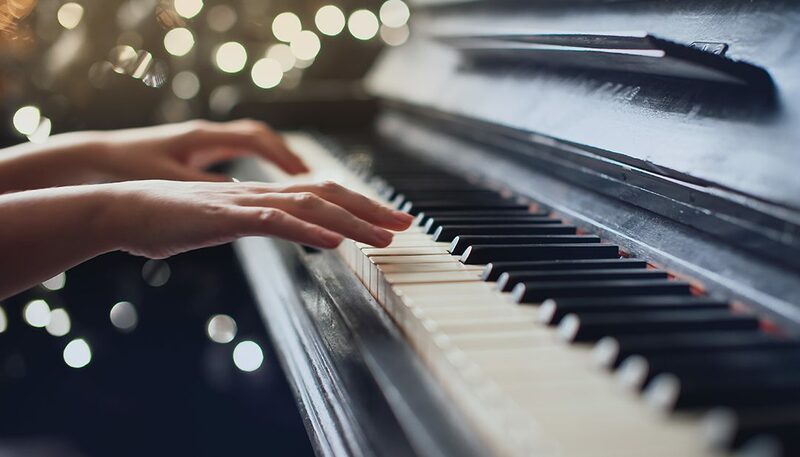 A piano technician is typically able to even out a piano tone, though changing the overall tone of the entire piano is slightly more challenging and time-consuming. A big piano sound is used to describe a piano that has a lot of power and resonance. A pianos power is usually determined by its hammers, long strings, and a high quality soundboard. Pianos with “big” sound are able to project in environment such as auditoriums or concert halls, where pianos with smaller sounds keep the sound more contained. Can piano tone be changed? Somewhat. Experienced piano technicians can manipulate the tone or timbre of a note. This process is called “voicing.” It’s important to note that voicing is different from tuning, which manipulates the pitch of a note. A technician will be able to voice a piano. The most common voicing is to even out the tones of different notes, while voicing the entire piano is more time-consuming and takes greater expertise. It’s also more common to voice a large piano to sound better in a small room, whereas it is difficult or impossible to voice a small piano to sound better in a large room. Do piano tones change over time? Yes. The sound of a piano will brighten over time as the hammers’ felt becomes worn and packed down. Harder, drier felt will produce a brighter sound, while thicker, softer felt will create a more mellow tone. Felt can also absorb moisture, which will produce a more mellow tone. This same phenomena also often leads to an unevenness in piano tone note-to-note as some notes are played more frequently than others. Which piano sound is best? It’s entirely up to preference! Some people prefer clear, bright piano sounds, which is often considered to have more of a European influence. Some prefer a more mellow, dark and rich tone. If you have no preference, you may consider going with a more mellow tone since the tone will naturally brighten with time.